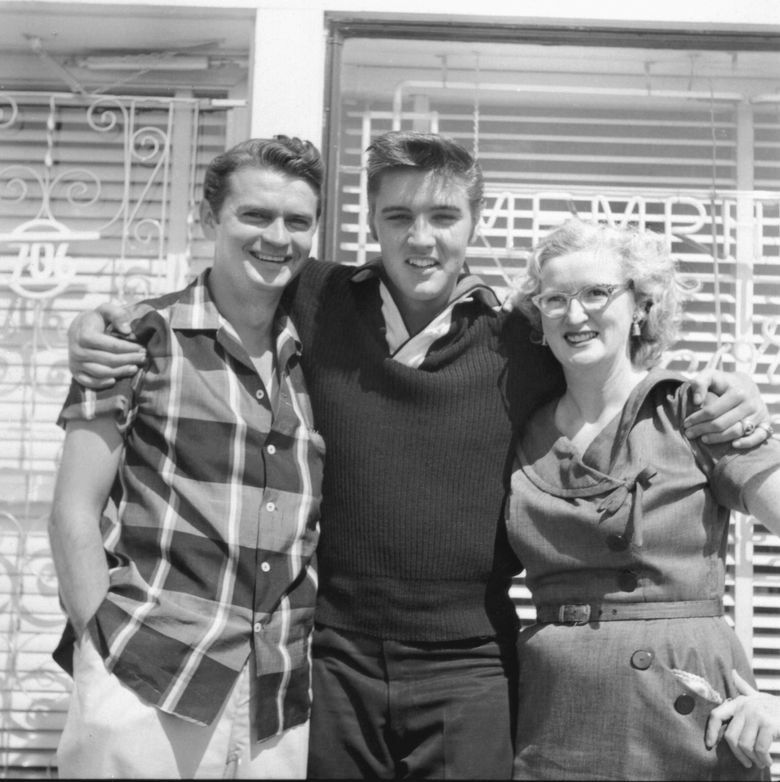 Sam Phillips, Elvis Presley and Phillips’ colleague at Sun records, Marion Keisker, Sept. 23, 1956. Peter Guralnick, biographer of impresario Sam Phillips, said the man who discovered Elvis, Johnny Cash and Howlin’ Wolf believed American music had the power to give voice to all Americans, black and white. Guralnick appears Wednesday, Nov. 18, at Seattle’s Elliott Bay Book Co. If you know one thing about Sam Phillips — and you probably do, if you grew up on rock ’n’ roll — it’s that he discovered Elvis Presley. But award-winning author Peter Guralnick, who talks about his new biography of Phillips at Seattle’s Elliott Bay Bay Book Co. Wednesday (Nov. 18), says that even though Phillips was justifiably proud of that achievement, he routinely steered conversations about Presley back to the blues artists who preceded him. — “but never above Little Junior Parker or Howlin’ Wolf,” Guralnick said. Author of “Sam Phillips: The Man Who Invented Rock ‘n’ Roll” will appear at 7 p.m. Nov. 18, at Seattle’s Elliott Bay Book Co. Free (206-624-6600; elliottbaybook.com). From the very beginning, said Guralnick, Phillips had an inclusive, “Whitmanesque” vision of a music that would break down racial barriers, giving voice not only to African Americans, but to poor whites as well — a visceral, rhythmic, straightforward music that spoke of pain and promise, joy and despair. In other words, what we came to know as rock ’n’ roll. “His relatives spoke of him talking about race in this manner from the time he was a little kid,” said the author, who enjoyed a friendship with Phillips that spanned more than two decades. Guralnick has spent his career documenting American roots music, including biographies of Presley and Sam Cooke. Guralnick said that hanging out with the legendary record producer, who died in 2003, was an extraordinary experience. And what a life Phillips led. After Sun’s late-’50s heyday, he pretty much disappeared from public view for two decades, emerging only later to be honored as a rock pioneer. But during his “away” period, the same creative juices and will to succeed impelled Phillips to run an all-female radio station, call Fidel Castro personally to apologize for the Bay of Pigs invasion and make a foray into zinc mining. Guralnick, who has published two books of short stories and teaches creative writing at Nashville’s Vanderbilt University, employs a novelistic approach to tell Phillips’ sprawling story, drawing the reader vividly into the moment. Who knew, for example, that just as Presley was breaking out, Sun was almost broke and Phillips’ marriage was on the rocks? Guralnick said he could have written the “linear” story of Sam Phillips a decade ago, but digging for the gems — such as the “raw” doctors’ correspondence about Phillips’ shock treatments in 1944 and 1951 — drew him into the “highways and byways” of Phillips the man.